The family wanted to help fund some microcredit projects, but they also wanted to do it in the same creative spirit with which the credit recipients earned their incomes. The Hydes were interested in how different cultures portray the Christmas Nativity story, so they decided to purchase Nativity scenes made by humble artisans in poor countries. “I loved how I felt knowing that with each purchase we were making a difference to an artisan,” Hyde says. The Hyde family began buying sets for their collection. “We thought we might buy a few, but we felt compelled to keep collecting more,” Hyde says. Then God took the opportunity to tell Hyde that he could do a lot more to help artisans than to purchase only one Nativity for the family’s collection. The inspiration came to import shipments of Nativity scenes and sell them for the artisans as a service project. The Hydes have managed to keep their expenses low, and none of the proceeds from purchases of Nativity sets go toward any overhead for their nonprofit organization, World Nativity. The Hydes donate their time as well as all packaging and administrative expenses. This enables them to direct their modest profit directly to seeding new projects. Since 2005, World Nativity has sold more than 1,700 Nativities for poor, struggling artisans, and has given $50,000 to charitable causes, including microfinance organizations. They originally started selling their Nativities on eBay to reach a broad base of customers. 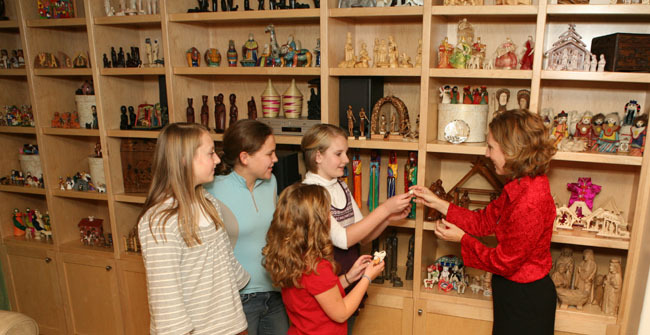 Then in late 2007, they created the web site www.worldnativity.com, where they showcase the Nativities they sell, as well as their own collection.